Set sail with Captain Jack Sparrow in five spectacular films! Experience the full sweep of the Pirates Of The Caribbean phenomenon in all its action-packed glory. Pirates Of The Caribbean: The Curse Of The Black Pearl: Young sword-maker Will Turner teams up with Captain Jack Sparrow to save his love, Elizabeth Swann, from a band of undead pirates. Pirates Of The Caribbean: Dead Man's Chest: Captain Jack Sparrow races to recover the hear..
Own Pirates Of The Caribbean - 1 to 5 Movie Collection DVD from Deff, DVD, Blu-Ray & 4K Video Specialists - Free UK Delivery.. Simply put this Blu -ray two-disc edition of Pirates Of The Caribbean : At World's End will blow you out of the water. Trapped on a sea of sand in Davy Jones' Locker, Captain Jack Sparrow (Johnny Depp) is the last of the nine Pirate Lords of the Brethren Court who must unite in one last stand to preserve the freedom-loving pirates' way of life. But first, he has to be found and rescued. Your jaw will drop, your eyes will pop as every sc..
Just when he's needed most, Captain Jack Sparrow (Johnny Depp), that witty and wily charmer of a pirate, is trapped on a sea of sand in Davy Jones' Locker. In an increasingly shaky alliance, Will Turner (Orlando Bloom), Elizabeth Swann (Keira Knightley) and Captain Barbossa (Geoffrey Rush) begin a desperate quest to find and rescue him. Captain Jack's the last of the nine Pirate Lords of the Brethren Court who must come together united ..
Pirates Of The Caribbean: Dead Man's Chest pulses with heart-pounding excitement in a Blu-ray 2 disc-set created from the original digital source files. Johnny Depp, Orlando Bloom and Keira Knightley set sail for uncharted adventure in Disney's epic swashbuckler - now more thrilling than ever in this mind-blowing format. Captain Jack Sparrow has a blood debt to pay: He owes his soul to ghastly Davy Jones unless he can cheat death - and .. The year's most anticipated blockbuster event is a fun-filled treasure trove of curses, creatures and epic adventure featuring the return of all your favourite Pirates of the Caribbean. Charming rogue spirit Captain Jack Sparrow (Johnny Depp) is back with a blood debt to pay - he owes his soul to the legendary Davy Jones, ghostly Ruler of the Ocean Depths. This time, dashing Will Turner (Orlando Bloom) and the beautiful Elizabeth Swann ..
From Disney and Producer Jerry Bruckheimer comes all the fun, epic adventure and humour that ignited the original. 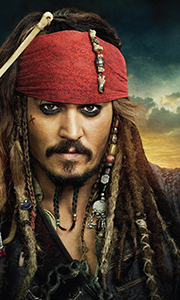 Johnny Depp returns as Captain Jack Sparrow in Pirates Of The Caribbean: On Stranger Tides. A tale of truth, betrayal, youth, demise - and mermaids! When Jack crosses paths with a woman from his past (Penelope Cruz), he's not sure if it's love, or if she's a ruthless con artist using him to find the fabled Fountain of Youth.. The final adventure begins. From Disney and Producer Jerry Bruckheimer comes the harrowing and thrilling Pirates of the Caribbean: Salazar's Revenge. Set sail with Captain Jack Sparrow (Johnny Depp) as deadly ghost sailors, led by the terrifying Captain Salazar (Javier Bardem), escape from the Devil's Triangle bent on killing every pirate at sea - notably Jack - in an epic story packed with humour, suspense and amazing special effects! ..
Pirates Of The Caribbean: The Curse Of The Black Pearl pulses with heart pounding excitement in a Blu-ray 2-disc set created from the original digital source files. Starring Johnny Depp, Disney's action-packed thrill ride delivers more mile-a-minute adventure than ever in this mind-boggling format. Climb aboard as legendary pirate Captain Jack Sparrow and young sword-maker Will Turner join forces to rescue a governor's daughter from a b..
From producer Jerry Bruckheimer (Pearl Harbor) and director Gore Verbinski (Mouse Hunt) comes the thrilling, high-seas adventure Pirates Of The Caribbean: The Curse Of The Black Pearl. The roguish yet charming Captain Jack Sparrow's (Johnny Depp) idyllic pirate life capsizes after his nemesis, the wily Captain Barbossa (Geoffrey Rush) steals his ship, the Black Pearl, and later attacks the town of Port Royal, kidnapping the governor's b..
Own Pirates of the Caribbean - Can You Keep A Secret Mug from Deff, DVD, Blu-Ray & 4K Video Specialists - Free UK Delivery..
Own Pirates Of The Caribbean - Salazars Revenge 3D+2D Blu-Ray from Deff, DVD, Blu-Ray & 4K Video Specialists - Free UK Delivery..
Own Pirates Of The Caribbean - Salazars Revenge DVD from Deff, DVD, Blu-Ray & 4K Video Specialists - Free UK Delivery..
Own Pirates of the Caribbean - Skull Mug from Deff, DVD, Blu-Ray & 4K Video Specialists - Free UK Delivery..